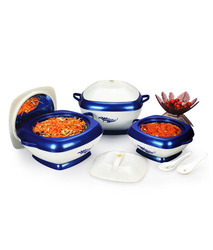 Our range of products include fluidic hot pot set of 3 pcs and insulated hot pot set. Fluidic hot pot set of 3 pcs. is available in various colour options. fluidic casseroles are made of high quality polyurethane material, high quality isothermal containers. 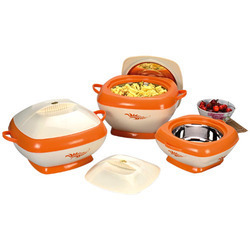 Our respectable customers can avail from us an exquisite range of Insulated Hot Pot Set. All these hot pot sets are manufactured using excellent quality plastic that is sourced from most reliable and trusted vendors of the market. Our experienced quality controllers inspect these products on certain parameters of quality to rule out every possibility of defect. We are a reputed organization; which is involved in manufacturing, supplying and exporting high quality Insulated Hot Pot Set. Our offered product-line has maximum temperature retention properties and stainless steel inside lids. These products are inspected on certain parameters of quality in order to ensure their flawlessness. We specialize in manufacturing, supplying and exporting optimum-grade Insulated Hot Pot Set. The range offered by us is manufactured using excellent quality food grade plastic so that it is in tandem with international quality standards. These plastic insulated sets have maximum temperature retention capabilities.